Poke’s come a long way from its origins in pre-contact times, when ancient Hawaiians feasted on freshly caught fish massaged with sea salt, seaweed and crushed inamona (a condiment or relish used in traditional Hawaiian cooking made from roasted kukui nut and salt) or kukui nuts. Today poke shops are popping up from Los Angeles to Kansas City to New York. But what of poke in the Islands? Where has poke’s path taken this iconic dish? Poke’s evolution has been fairly straightforward. Changes mirror the tastes of new arrivals to the islands. When ships from the US West Coast dropped anchor in local ports, sailors traded salmon for salt. Waves of immigrants from China and Japan introduced soy sauce and sesame oil. sugar, salt, and MSG) salmon, miso tako (octopus), pipikaula (dried beef) and even bacalao poke made with Portuguese dried salt cod. That’s all at supermarkets and poke shops. What about at restaurants, where poke appears on plate lunches, prix fixe tasting menus and everything in between? Here’s a glimpse of poke in its myriad forms today. Exactly what you’ll find on the US Mainland—NOT! Thanks to poke shops and supermarket poke counters, poke bowls are seemingly everywhere in Hawaii. The hearty serving of rice that anchors the dish transforms poke from a snack into a meal, but there are key differences with many Mainland versions. First, poke in Hawaii is marinated in its dressings, even if for only 15 minutes, to allow the fresh seafood to absorb the flavours. And second, here’s a list of what you’ll never find in a local-style poke bowl: quinoa, chicken, zucchini noodles, cauliflower, corn, kale, bamboo shoots, mango, orange slices, almonds. Perhaps poke’s most popular contemporary fusion form, poke nachos are just that: fresh poke spooned atop crispy nachos and drizzled with tasty sauces. You’ll find a version with avocado and nori at Nico’s Pier 38 in Kailua and a poke tower surrounded by corn chips at Uncle’s Fish Market & Grill, but the most behemoth is at Poke on da Run in the Pearl City district of Oahu. Here the Mauka to Makai Nachos start with light, freshly fried won ton chips topped with twin scoops of kalua pig (mauka = toward the mountain) and ahi poke (makai = toward the sea). Spicy aioli, a secret Hawaiian sauce and a sprinkling of green onions top a creation so massive it takes a couple of rubber bands to close the takeout container. Sweet, salty, spicy, briny flavour notes dance across the palate, with a lot of crunch. As a meal, it feeds two; as a pupu snack (shared tapas-style food) it’s enough for four. Pristine cubes of translucent ruby ahi: That’s what you’ll find tucked inside fresh, crunchy wonton shells at places like Moku Kitchen and Monkeypod Kitchen. As with all good tacos, sprightly garnishes amp up the freshness and round out texture and flavour. This is a rare poke version that you can eat with your hands. You’ll want a frosty glass of your favourite local craft beer to quaff with this. A specialty of East Oahu’s Otsuji Farm, these sliders are an original, highly fusion creation of fresh ahi poke drizzled with furikake and spicy mayo atop a “bun” of tempura-fried kale. The blend of crispy-soft textures and warm and cold temperatures makes this a delectable mouthful. You’ll find Otsuji’s sliders next to its vegetable stands at Hawaii Farm Bureau farmers markets on Oahu on Wednesday evenings at Blaisdell Center, Thursday evenings in Kailua and Saturday mornings at Kapiolani Community College. Few descriptors suffice for the poke that appears in the 30-odd courses of Sushi Sho’s $300 omakase menu at the Ritz-Carlton Waikiki Beach. 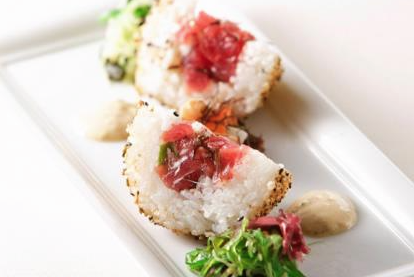 The poke of Edomae sushi master Keiji Nakazawa, a legend among gourmands in his native Japan, features singular cubes of fresh island ahi with soy and Maui onion mustard, salmon smoked in banana leaves, and snapper with a macadamia nut soy sauce. It appears as a playful pupu between exquisite bites of nigiri sushi featuring seafood that’s been aged, cured, pickled, seared and otherwise treated to coax out maximum flavour—part of Nakazawa’s quest to create a new style of Edomae sushi equal to the best in Japan but unique to the Islands. The iconic dish at Hoku’s restaurant in Kahala combines two favourite Island foods—poke and rice balls—and deep-fries the whole thing. The ahi poke is stuffed inside a ball of lightly seasoned sushi rice that’s coated in salty, briny furikake before it’s fried. Hot and crispy outside, tender and fresh inside, it’s served with a lightly pickled crab-cucumber salad. Why more people haven’t thought of this is a mystery: spicy ahi poke tucked inside Hawaii’s ubiquitous cone sushi wrappers. Tanioka Seafoods of Waipahu is West Oahu’s iconic poke shop, with lines of hungry fans snaking out the door at lunchtime. Spicy ahi poke, a best-seller, fills pockets of sweet, bite-size inari, made from thin sheets of deep-fried tofu, much the way hummus fills pita pockets. Tanioka’s sells them in packs of three. New on the poke scene is this creation from a supermarket. Foodland, popular among locals for its poke selection, debuted this tostada topped with ahi poke, jalapenos, cilantro and ponzu sauce at its Foodland Farms location at Ala Moana Center—and triumphed over K-Town Poke Balls, Beet Poke with Pickled Limu and other creations from award-winning chefs at the store’s Poke Battle. Foodland Farms isn’t your ordinary supermarket. It’s a wonderland of farm-fresh local produce, meat from Island ranchers and fresh seafood, much of it prepared on-site for customers to enjoy at a dining area in the store. Want to learn how to make poke on your own? 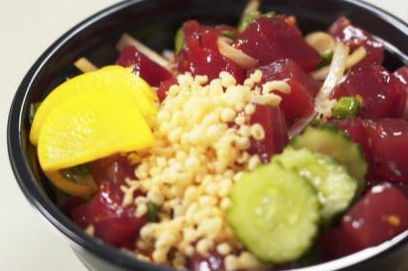 See how five of Oahu’s most popular poke spots make theirs.